Sydney Harbour preoccupied Lloyd Rees as a subject in the 1930s, and he made many drawings of its environs. 'Sydney skyline from McMahon's Point' is a delicate and rare contrast to some of his more intensely worked and detailed pencil drawings, with gentle washes of watercolour. 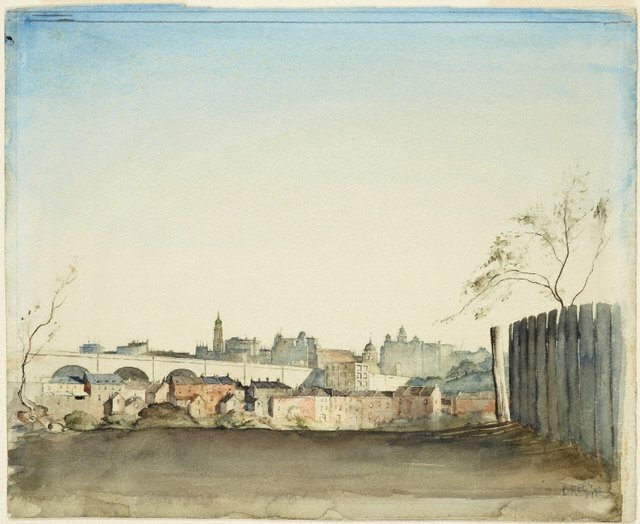 Unlike other artists of the time, Rees ignored the development of the Sydney Harbour Bridge, a major engineering project of the day, preferring to concentrate on distant views of the city and the trees and rock formations that skirted the harbour foreshores. Signed and dated l.r. corner, "L REES/ 1932".